Here I am in Cadiz to attend 2017 edition of Lambda World. Cadiz is really a nice frame for this conference and the weather is so good that it seems to be back at vacation time instead then in mid-Autumn. Anyway, on this morning I attended the “unconference”, a sort of informal prelude to the real conference. After the first, planned talk, people could register to present their talk and other attendants could vote their preferred talk. This yield two interesting talk – one on declarative testing and the other one on category theory. Here is what I learned from the last one, by Rùnar Bjarnason. First, this is algebra stuff, really. Not the kind of ‘a+b’ you do in mid schools, but the high order stuff you do later when you study groups, monoids and the likes. How does these concepts applies to practical programming still eludes me, but I sense that something is there waiting for my brain to grasp it. Basically an abstract algebra of function wants to answer to the following questions – what functions do? And what can we say about them? Here we go, all mistakes, errors, inconsistencies are just mine, blame me not Rùnar. A Category is defined by objects and arrows and how we can compose those arrows. Some types: A, B, C.
As long as types line up we can concatenate function composition. (so no need for parenthesis). E.g. natural numbers are a category for preorder. Monoids are categories with one object. This object, by convention, is written as ‘*’. All arrows links * to itself. In a turn of notation I’ll use the symbol |+| for composition and ‘mzero’ for identity. Object is just an anchor, to hold arrows. e.g. string length : _.length is a monotonic function. M[M[M[A]]] : can be associated as we want, preserving the result. A monad is a monoid in an endofunctor category. Reacting to the movies: reactive systems and the lessons of narrative. Another Reactive Summit 2016 talk. Speaker was Steve Moore – IBM story strategist. My comments at the end. (When writing about heros I used “she” as pronoun, if you are sensitive to this use sed s/she/she\/he/g). Thinking differently helps you gaining new perspectives on your work. That’s the work for story strategist and this is the idea behind this talk. Finding analogies between reactive systems and movies. Scalability : heroes are under constant pressure to scale. Scaling is usually achieved via some resource. The best resource a hero has at her disposal is a new understanding of the world. There are three form of escaping in the scaling up of the hero. Escape the skin. The hero is trying to escape the fake reality she’s living to reach the real and more complex reality behind. Paranoia and questioning foundation of the system are the mean to achieve this escape. This can be summed by the question: “Are you being paranoid enough”? Escape the story. The hero lives in a world she wants to escape. This is different from the deception of the escape the skin (first form). The question is “are you being patient enough?” Sometime you need to take the time to observe and understand. The plot directs the hero where is needed by the story. Stories are all about failures – the plot is just a sequence of failures that get the hero further and further away from his goal. Heroes never ever give up. Likeability is not required by heros. Coordination among the teams is needed. Elasticity means that response does not change when workload changes or accidents happen. What defines the genre is a set of rules. Genres are categories of antagonists. An antagonist puts strain on the hero. Human v. Nature. The natural world is challenging the hero. Natural antagonists are simple, unbeatable and unchangeable. These stories are about survival. If you live, you deserve to live. “do you deserve to live?” If the system were in danger do these people would do something to protect it? Human vs self. Hero is also the antagonist. The hero doesn’t want to push away something that is abundant in his life. This kind of abundance forces the hero to questioning the reality “can you endure abundance?” We need to transform ourselves and the system at the same time. This is the only way the system has to survive. This talk was very interesting even if not very practical or even theorical. I like the idea that adding word to vocabulary and concepts to the programmer resources may help to devise better system or to enhance the understanding of the system. It makes food for lateral thinking (lateral food?). One of the first person we met at the luminaries barbecue the day we arrived, had the following job title “Chief Storyteller”. Maybe this is a sign of times. 016. 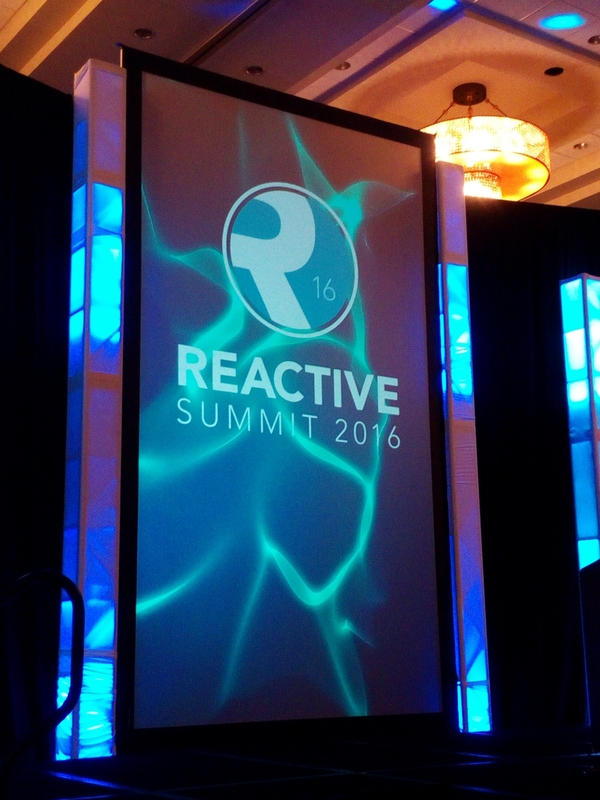 Two days crammed with interesting speeches by luminaries of the reactive community. I’ll try my best to provide a brief summary of each talk I will attend, reportin faithfully what the speaker said and adding my thoughts. If you know about reactive systems and you read something unreasonable it is likely I missed something in the process. This talk is by Edward Hwu – mesosphere. (I’ll leave out the quote about Justin Bibier being the reason for having reactive systems… in part because I missed something). If you compare the number of Internet users today with the same number a few years ago you will notice that it has increased manyfolds. Almost everyone owns a smartphone and almost everyone use it to interact with Internet. Regardless companies that make business over Internet need to be sure to be able to comply with these large number of interactions in order not to lose customers and business opportunities. Because of the increase in the number of Internet users an architecture shift was needed: distributed systems are the only way for industry to cope with this growth. Modern applications that runs websites are made from open source software, VMs have been replaced by containers that have shorter startup time and are lighter to run. Additionally containers provide the means for elasticity – they can be used just for the time needed for run the service – and allows for fast and frequent releases. Data services provide connection and persistence. Mesos is the core component of DC/OS whose purpose is to manage and abstract data center in the same way a traditional OS abstracts from hardware. Where the traditional OS operates on a single computer, DC/OS operates on the whole data center. Here’s my thought. Well DC/OS seems to be the real shift in distributed systems. My impression is that the era of custom made software to handle the specific aspects of distributed system (such as load balancing, or provisioning) is going the way of the dodo since structured and standard solutions are being developed. Having the facility to handle the whole datacenter with simple commands is possibly going to revolutionize datacenter in the same way docker revolutionized application deployment. The latter avoiding developer to keep track manually of all the dependencies and providing a sensible installer, the former avoiding manual install on multiple node with configuration twiddling. Maybe this technology is a bit ahead – I’m saying this because I found no trace of the universe app store on the internet (maybe I didn’t search enough), but for sure is very promising and being open source, free for all, is something that for sure will provide widespread adoption. Scala Days 2016 is over. I’m sorry I didn’t make it to take notes of all the talks I attended, but some speakers spoke very fluently and my phone is not the best way to write down notes. English doesn’t help as well, and sometimes my understanding of the matter was lagging behind. So what are my impressions? That’s a good question and I’m not sure about the answer. I think Scala is a very fitting solution for a specific niche. Then as every other programming language can be used for everything (I just heard that Dropbox employs 2.7 million lines of Python code). The niche I have in mind is made of large, distributed applications, handling zettabytes of streaming data, performing math functions over them. A part of the niche could also be composed by high traffic, highly reliable web services (where service is just a general term and refers to any kind of service, including serving web pages). In this niche using Scala, with actors and possibly Spark makes a lot of sense. In other contexts you risk to pay the extra run for something you don’t really need – not every server software needs to scale up, not every process needs to be modeled using events. Although functional paradigm eases writing code that copes with these contexts, you still pay an extra cost. It is hard to quantify how much. The naïve experiment of having two programmers of comparable proficiency in two different languages working at the same task is very hard to setup. According to an old research the productivity of a programmer, intended as line per unit of time, is more or less the same regardless of the language. That means, for example, that it is cheaper to write programs in C than in assembly, because C is more expressive and higher level than assembly. I’d like to know if the same holds for Scala, where lines tend to be long concatenation of function applications. For sure this is at a more abstract level, but it requires quite an effort to write, lot of effort to understand and it is close to impossible to debug, at least with today tools. Well back to my impressions on the state of Scala. Scala is comparatively young and suffers from its youth. There are pitfalls and shortcomings in its design (just as naturally is for every other language) that are starting to be acknowledged by the language owners. The solution they seem to prefer is to rewrite and go for a next incompatible version. This is a dangerous move as Python would teach. Also is somewhat that does not acknowledge the industry. It makes sense for a teaching tool, for a research language, but it impacts badly on industry investments. In several talks the tenet was that although Scala allows the programmer to chose any of the supported paradigms, only functional programming is the proper way to code. Surprisingly, at least to me, Martin Odersky, the language father, doesn’t agree, when attending a talk, he claimed that multi paradigm was a bless when programming the Scala compiler. Industry needs pragmatism, but I see it only partially. Enthusiasts may crosses the border to become zealots. And crusades are not something that could bring stability and reciprocal understanding. When I hear about functional programming revolution I am somewhat scared, I prefer evolution, acknowledging the goods of existing stuff and building over them. In revolutions many heads roll, included those of innocent people. The most widespread background for programmers here was Java. I understand that Java is not the most exciting language. Coming from C++ I find Java quite boring. And, in fact, some, if not many, of the advantages of Scala over Java can be found in C++ as well. Unfortunately C++ falls short of open source industry standard libraries. You won’t find anything in C++ that comes close to what Spark or Akka are for Scala. Also Play – even if it doesn’t encounters a unanimous consensus – is the de facto companion library for web services and web development. Back to Scala days (again) – it has been a positive experience, some talks needed some preliminary study even if they were marked as beginner (everything pretending to explain implicits). Other talks were quite marketing advertisements in disguise. And some were genuinely fun. I think I got closer to this language and had great opportunities to change my point of view. My wish is for an ecosystem more attentive to the industry and that values back-compatibility rather than see anything that breaks with the past a way to make easy money by selling technical support. Talk by Tim Soethout. The average age among attendees seem to be higher than other talks, maybe we elders are looking for understanding finally what the hell are implicits (then we would need something similar for monads…). Here we go. Implicit enables you to use values without explicit reference. Implicit enables the relationship “is viewable as”. As a parameter the value is taken from the calling context (eg akka sender). Implicits are used for DSL, type evidence (whatever this be), reduce verbosity… Other stuff I didn’t make to copy. Caveats – resolution can be difficult to understand. Automatic conversions. For these reasons better to not overuse. Implicit parameter just takes the only variable with a matching type as argument. If two or more variables with a matching types are available an error is reported by the compiler. Implicit conversion (please avoid them) allows to automatically convert from a type A to a type B every time B is required. This comes handy to convert from and to Java collection types, but it is deprecated. The new approach is to add the asScala method to the Java types. Implicit view is not understood by yours truly, sorry. Implicit class. This is used when a class is missing a method. You can write a wrapper to add what you need. If this is declared implicit then when the compiler finds an invocation to the new method the wrapper class is constructed and the method is invoked. Scoping. Some explanation I didn’t understand. Interactive moment turned quite to an epic failure with most of the attendees having no idea on what was going to happen in the example shown. Type classes. This concept is used for ad-hoc polymorphism and to extend libraries. A naive approach to serialize to json uses subclasses. All the classes need to inherit from a JsonSerializable and to define the serialization abstract method. With type class the class to serialize do not need to derive from the same base. A generic trait is defined for the serialization method. By defining implicit variables and assigning them the class which defines the serialization for the specific type then type serializers will be uses when needed. Other examples just make things worse for me, I though I got it, but now I’m no longer sure (also, now, rereading what I wrote, I’m unsure I understood anything at all). Wrap up time. I still don’t get this stuff, at least not completely and only slightly more than “danger – do not use”. Type class seems to be really powerful in the sense that they lift Java from its pond to the static polymorphism of C++. But the mechanics that power this specific kind of implicit are still obscure to me. Likely nothing that a good book and some months of hard study couldn’t solve. Just it seems not to be some knowledge you can transfer in a conference. 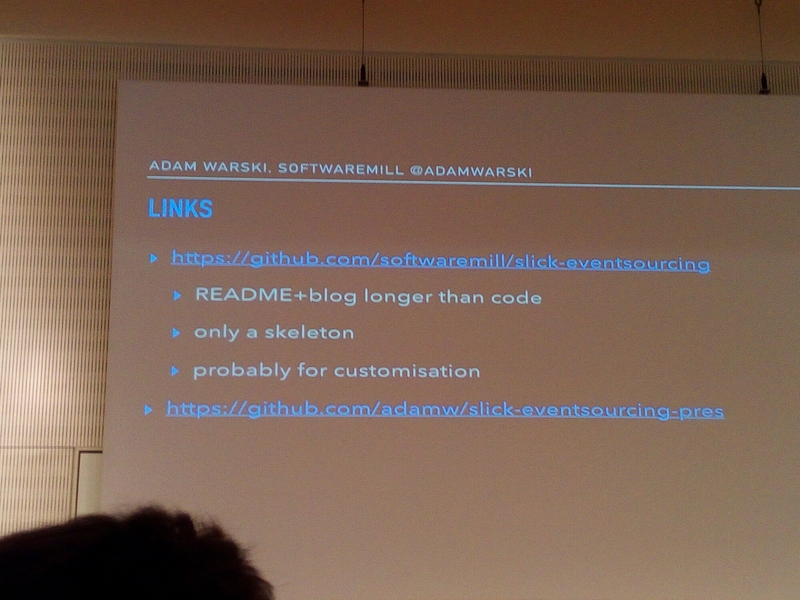 Talk by Adam Warski. Event sourcing means that all the changes in the system are captured as a sequence of events. Reasons for event sourcing: keeping information (not losing info), auditing the information in the system. But it is also useful to recreate the system state. Hibernate was a technology developed by Adam for Java. The goal is to have event sourcing with rdbms. There are other approaches (event store, akka persistence, eventuate). Event is immutable, is the primary source of truth. The payload is an arbitrary json, the name is the case class name. Transaction ID, event ID and user ID. Events are stored in a dedicated table. A read model is created on the event in the crud. This gives consistency. DBIOAction[T] gets a description of actions to be done. User data arrives in the system, within a command (a Scala method). The command uses read to validate the data, if data is valid the command generates a series of actions to perform that updates the model. Event listeners are triggered at this time. Each event listener may trigger further events. Demo follows for ordering a Tesla model 3. Summary – no library, just a small adapter. Event listener performs side effects. The system could have been written with free monads. That would have improved testability. But free monads don’t come for free – you have to pay a price to decode them from the code and figure out what the code is trying to do. As Adam said, maybe it’s just me. And saying this here while presenting a relational db approach takes really a brave heart. Connecting reactive applications with fast data using reactive streams. Talk by Luc Bourlier. As in the previous posts these are my quick notes. Who doesn’t know what a reactive application is? Responsive, elastic, resilient and message driven – this is what reactive apps are. Big data means that there are too much data to be handled by traditional means on a single machine. Fast Data are big data that comes in big volume and you want up to the second information with continuous process. Spark streaming is the technology by light bend that does the trick. Spark is an evolution of map reduce model. A driver program (spark context) talks to the cluster manager to get worker nodes to do the job. Spark can be used on streams by using mini-batching. A mini batch is the work executed on data received in a unit of time. Spark streaming deals with all kind of failures (hardware, software and network). It also handles recovery for continuous processing and deals with excess of data volume. A demo is presented with a raspberry pi cluster. (On raspberry pi you don’t need to push the system to the limit, because you are already at the limit). Demo ran fine, but it broke, that makes me wonder how stable is this technology. The demo model seemed quite simple. Back pressure is the mechanism implemented by akka streaming to slow the data producer if the consumer is not able to consume data fast enough. Congestion in spark was handled by static limit on the input rate. In spark 1.5 the limit has been changed into dynamic rate limit. There is a rate limit estimator based on PID that sets the rate limit. It may not be a great surprise, but the opening key note is held by Martin Odersky. I don’t feel much expectation, more or less everyone expects he’s going to repeat the opening speech of the last Scala conference in New York. In this post I’ll just summarize the content, my considerations will be in a next one. Scala days are going to be attended by some 1000 people. Conf app is, of course written in Scala and swift (and it’s open source) courtesy of 47 degrees. Odersky enters with son et lumier effect, halfway between a disco and an alien abduction… Maybe both. First he shows a steady growth of the language. Scala jobs get a little over the line. There is no comparison with Java, of course, but there is no drop in popularity. He will talk about the future, next, mid and distant futures. What’s next? Scala center, Scala 2.12 , Scala libraries. Scala center is a vendor neutral initiative supported by several partners that promotes Scala, and undertakes projects that benefit all the Scala community. Scala 2.12 is the next release of the language, about to be completed. Optimized for Java 8. Shorter code and faster execution. This release will arrive mid year. Older Java versions will be supported by Scala 2.11 that, in turn, will be supported for quite a while. Not many new features: 33. Main contributors are from the community. Martin’s book “Programming in Scala” will be updated to 3rd edition to include release 2.12 of the language. In the farther future: 2.13 will focus on libraries – Scala collections, simpler, lazy, integrated with Spark. Backward compatible. Split Scala stdlib into core and platform. Stdlib was much prototypal with the idea that wouldn’t have lasted long. Scala js, and Scala native. 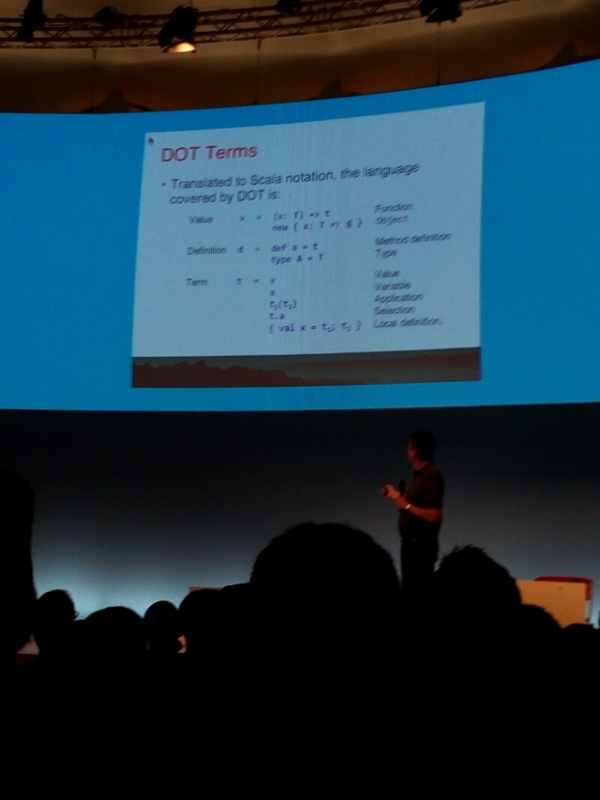 The dot is the foundation of Scala. a mini language, small enough that programs written in this language can be machine proof. Much of the language can be encoded in this language. 8 years in the working. Language work can be done with much more confidence. Type soundness, properties of code can be demonstrated (the examples say that an expression of type T produces a value of type T). Goal: Best language Martin knows how to make. Dropped: procedure syntax. Rewrite tool that will take care of translating. DelayedInit. Macros – of was just a long run example. There will be an alternative. Early initializers – for stuff that needs to be initialized before the base trait. Added: intersection and union types- types T&U just the common properties of the two types. T|U will have either the properties of T or the properties of U. Non blocking lazy Vals: locking time is much shorter now. Avoiding deadlocks. @volatile for thread shared lazy vals. Multiversal equality type safe equality and inequality operators. Named type parameters – partial type parametrization. SBT integration. Repl with syntax highlighting. Intellij. Doc generation. Linker. Scala meta – will replace macros and meta programming. Inline and meta. Executed by the compiler. Implicit function types . used to compose … Just more mess. Effect checking a->b pure function, a=>b impure. Checked by the compiler. Nullable types T? =T | Null. Types coming from Java will have a ? Because they have side effect. It is an alternative to monads. Guard rails – how to prevent the programmers to misuse or abuse the language. Strategic Scala style: principle of least power. Strategic Scala style. Libraries that inject bad behavior (eg implicit conversion). Implicit conversions will make a style error if public. Syntax flexibily. Even Martin regrets the space syntax. Add @infix annotation if the author intends it to be used as infix and give a style error in other cases. Operators are regretted as well . @infix will have the option to give names to such operators.